When we cleaned the boat and got everything ready for departure on Saturday evening, we didn’t know yet that an hour after hosing down the cockpit and deck everything would become covered in a brown-orange muck of Moroccan desert dust brought down by a shower. we had a white boat ! 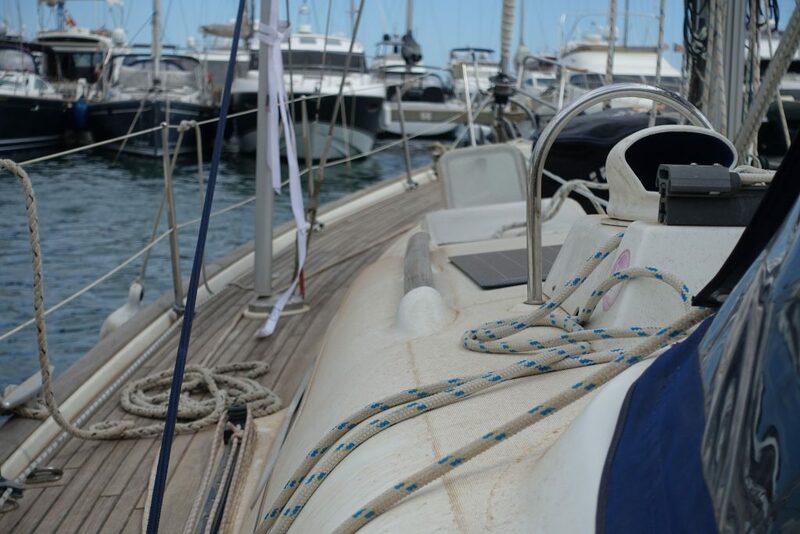 At 7 pm we left Cartagena and set sail for Dénia, a 120 mile passage, planning to arrive 24 hours later. The entire evening and night we saw (and dodged) rain and thunderstorms above land while (motor)sailing under a clear, windless, starry sky. Rene and I tried a new system for night watches this time. Instead of doing 3 hour watches we tried 6 hours. Rene took watch from 20:00 to 02:00 while I slept (with the kids joining him until 22:00), I took watch from 02:00 – 08:00 while Rene slept (with the kids waking up at 4 and joining me for about 12 minutes, until they fell asleep again and I put them to bed. As Robin said: “I thought doing night watches was exciting, but I just want to sleep!”) . I then took another nap after Rene took over. We’ll have to see how this works out on longer passages but we did both feel more rested and especially on calm nights a 6 hour watch seems doable (yay for superlong podcasts!!). We actually ended up having this dinner for lunch on Sunday, because on a last trip to get ice cream in Cartagena on Saturday we also ended up having Mexican for “lunch” as none of us had eaten yet after breakfast (at 5 pm…. oh well). Consequently, none of us were hungry Saturday evening, saving me a trip to the galley. Upon rounding Cabo de la Nao and up the coast to Dénia in the afternoon we saw several sunfish and Rene also spotted a flying fish. We’re now in the Marina de Dénia. On todays list is school and cleaning the boat, getting rid of all that desert dust. For fellow cruisers: in the Imray pilot (Med Spain, Costas del Sol and Blanca, seventh edition) it says that the water in the marinas in Dénia is salt or salty. While that still may be true for the other marinas here I tested the water yesterday using the TDS meter and found little difference between bottled water and the water from the dock (250 ppm versus 390 ppm – for reference seawater in Almerimar was well over 15.000 ppm).